It's not about bells and whistles, it's about deciding what your website really needs to build traffic. Launching even a bare-bones website—with little more than a landing page, products page, and contact information—can bring powerful results. And in the first two parts of this four-part series, developed in partnership with Squarespace, we looked at the steps that allow a small business to develop an action plan and select a template for its website. But after you’ve been in (the online) business for a while, it’s time to add more features and a stronger strategy for attracting more customers to your site. Here are three key questions to ask about what’s next for your site. What do you need at launch and what can wait? Once a small business owner decides to have an online presence, he or she wants a website up fast. The good news is that a website can be revised and changed quickly, so you don’t need to have every bell and whistle in place from the start. 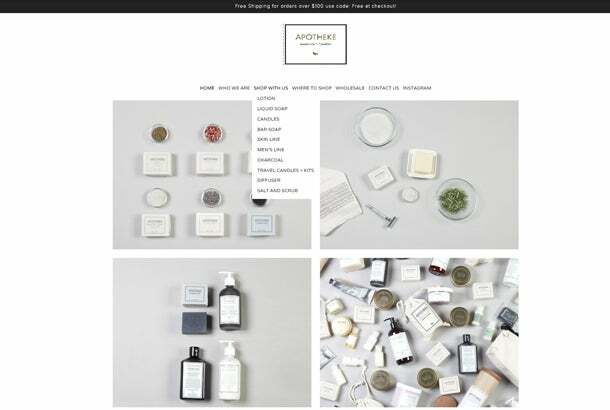 In keeping with an “easy-to-navigate” theme, Apotheke’s product page is uncluttered and features a simple drop-down products menu. In fact, many small businesses use their initial website to validate their market, meaning they gauge the reaction to their products and services from online visitors. Based on metrics of what your visitors look at and what actions they take, you might want to revise your site—or even your product line and business model. Once you feel secure your site is appealing to customers’ needs, you can add additional features that weren’t needed in the first go-around, like lengthy company bios. In Apotheke’s case, a link to the Instagram page was included right away, because that is a critical way that customers share information about its products, but the company waited on starting a blog. If you put yourself in your customers’ shoes, you can determine the reasons they would come to your site. This allows you to differentiate between the “must have” elements you need out of the box and the “nice to have” elements that can come later. How can you develop a mailing list to forge stronger customer relationships? If someone comes to your site and leaves without your knowing who they are, you’ve just missed an opportunity. Your goal should be to build a clean, up-to-date email list of engaged prospects and customers, so you can keep in contact and build a relationship. Good Candle, whose name precisely communicates the fine products it sells, simply put up a “Subscribe Button” at the bottom of its landing page. It asked for visitors’ email address with the promise “Sign up here and we’ll send you all the Good stuff.” A few times a year, subscribers are rewarded with exclusive deals and notice of upcoming sales. 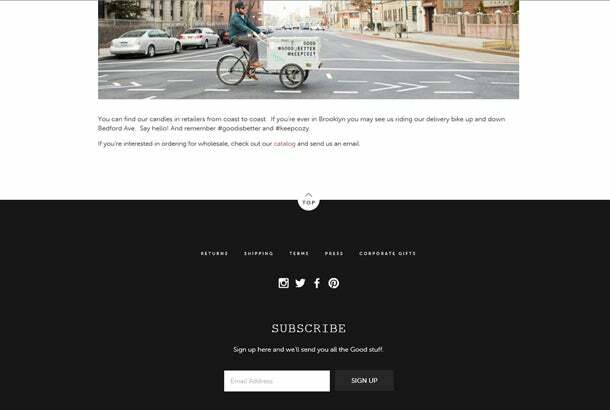 Good Candle takes a straightforward approach to building its subscriber list: just ask. Your subscriber form should specify that subscribers give explicit permission to be contacted, and make it clear what they will receive for joining in. And, as Good Candle’s success shows, ask only for the minimum amount of contact information you need to avoid turning visitors off. An email list can go stale within six months, so you need to send out communications in a timely manner without inundating people with material they don’t want. In addition, when you reach out to customers you should carefully think through the design and subject lines of your emails to make them compelling enough to open and read. Your focus should be the same as for your website: provide information that is enticing, relevant and useful to your subscribers. And pay attention to what actions subscribers take: Email marketing programs like MailChimp can provide lots of important insights, like letting you know emails you send on Thursday are opened far more often than emails you send on Monday and are integrated in some website services. What are the best ways to approach paid and free marketing? Another way to generate traffic is to look beyond your own URL and use paid or free marketing. Given that “free” is everyone’s favorite word, we’ll start there. 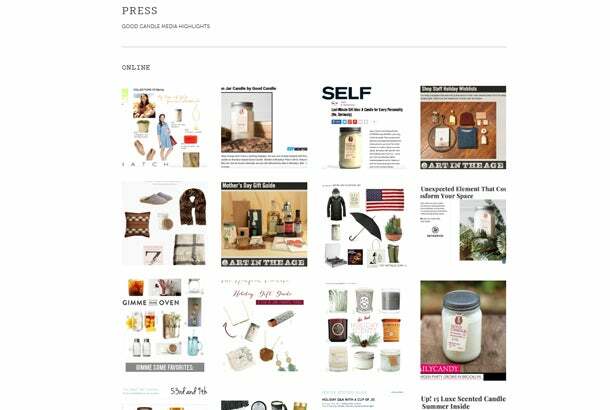 Johnathan Kroeger, founder of Good Candle, keeps an eye on blogs, news sites, and startup sites that feature products that appeal to his customers. He sends emails to these sites, offering to provide a sample of his latest fragrance for them to write about. He also arranges giveaways, where the sites are provided a number of candles to give to their visitors. One note: If you build your site on an all-inclusive platform, you’ll often be able to monitor all incoming traffic from a simple dashboard, helping you hone your marketing efforts in the future based on what works. Kroeger focuses on getting mentions before the critical holiday buying season. In August, he starts reaching out to online publications, angling for a place in their holiday gift guide. The key element to getting coverage for your website is identical to the fundamental purpose of the website: Provide information that is useful and truly interesting to people, rather than sell or toot your own horn. Good Candle makes the most of media coverage. Paying for advertisements is another effective way to drive traffic to your site. If your site targets professionals, you might want to use LinkedIn. If you are in a specialized niche, you might benefit from finding a social platform that is similarly narrow. Last holiday season, Kroeger began experimenting with advertising on Facebook and some blogs that appealed to his customers. “We started with Facebook, earmarking a limited amount of money to test the ads, and we’re happy with the spike in traffic we saw,” he says. “At this point, it’s all trial and error, and we’re still determining whether paid or free marketing is more effective for us. That reinforces the point that a website is an ongoing process, and you must constantly tweak, test and try new approaches to enjoy the biggest impact. In the final piece of this series, we’ll look at how you can enhance your business’ reputation, and drive additional sales and create stronger customer loyalty, by keeping your site fresh and accurate.